Aberdeen Developers .Net User Group are proud to be hosting a Hacktoberfest event on the 4th October 2018. Full details of the event can be found on the Meetup page. I have personally taken part in this event for the last three years, and I can vouch for the quality of the swag that you can get your hands on. Ok, so what do I get out of it? First up, you will need to register to indicate that you are going to be participating in the event. 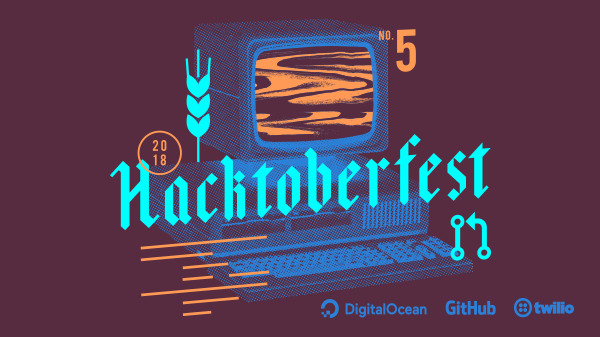 If you open up five pull requests between October 1 and October 31, you will get a free, limited edition Hacktoberfest t-shirt. NOTE: These pull requests do not need to be merged in order to be counted. They just need to be opened during the time frame of the event. In case you needed any further encouragement, you also have the ability to grab a free limited edition Microsoft t-shirt, which has been designed by Ashley McNamara. This was announced by Microsoft in this blog post. The rule for this t-shirt is simply to open a single pull request in one of the MANY open source repositories that Microsoft have. A full list of these can be found in the linked blog post. What is going to happen at the event? The event is going to start with me doing a very brief introduction to contributing to Open Source. This is something I have been involved in for almost 7 years now, and I am now actually working for a company based on the creation of Open Source software, so I have some great, and not so great, stories to tell about it. We will walk through the basics of doing your first pull request, and answer any questions you might have. With that out of the way, we will then jump straight into contributing to Open Source projects. If you have a particular project in mind that's great. If not, I can point you in the direction of some projects that I know need some help. Simply visit the Meetup page, and indicate that you will be attending. The number of registrations for this event is smaller than normal, but this is due to the space that we have access to. So I would ask that you only attend the event if you have every intention of completing the Hacktoberfest event. The only thing that you are going to need in order to participate in this event is yourself, your laptop, and some ideas about the Open Source Projects that you would like to contribute to. Drinks and some snacks will be being provided by Codify. Hopefully see you there, and feel free to reach out with any questions you might have.